Hardest of all, the Luftwaffe will smash Stepney. I know the East End! Those dirty Jews and Cockneys will run like rabbits into their holes. Between 7 September 1940 and 10 May 1941, a sustained bombing campaign was mounted. It began with the bombing of London for 57 successive nights, an era known as 'the Blitz'. East London was targeted because the area was a centre for imports and storage of raw materials for the war effort, and the German military command felt that support for the war could be damaged among the mainly working class inhabitants. 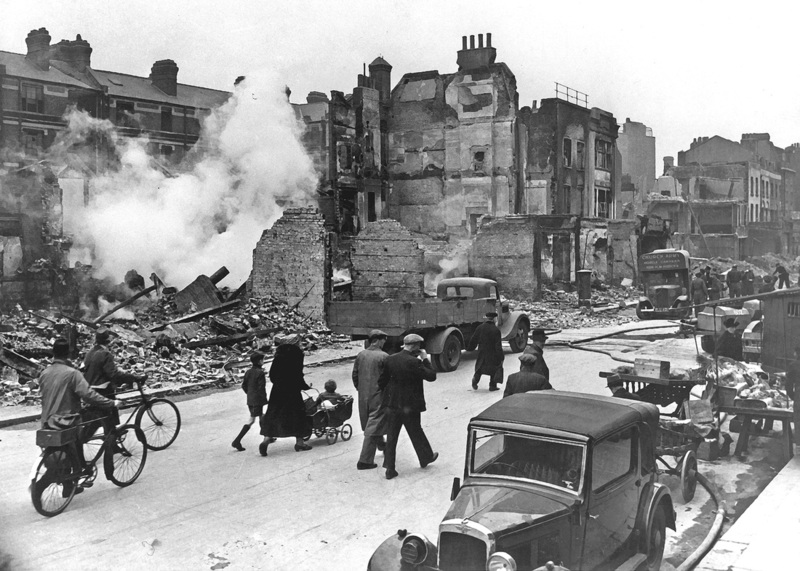 On the first night of the blitz, 430 civilians were killed and 1600 seriously wounded. The populace responded by evacuating children and the vulnerable to the country and digging in, constructing Anderson shelters in their gardens and Morrison shelters in their houses, or going to communal shelters built in local public spaces. On 10 September 1940, 73 civilians, including women and children preparing for evacuation, were killed when a bomb hit the South Hallsville School. Although the official death toll is many local people believed it must have been higher. Some estimates say 400 or even 600 may have lost their lives during this raid on Canning Town. 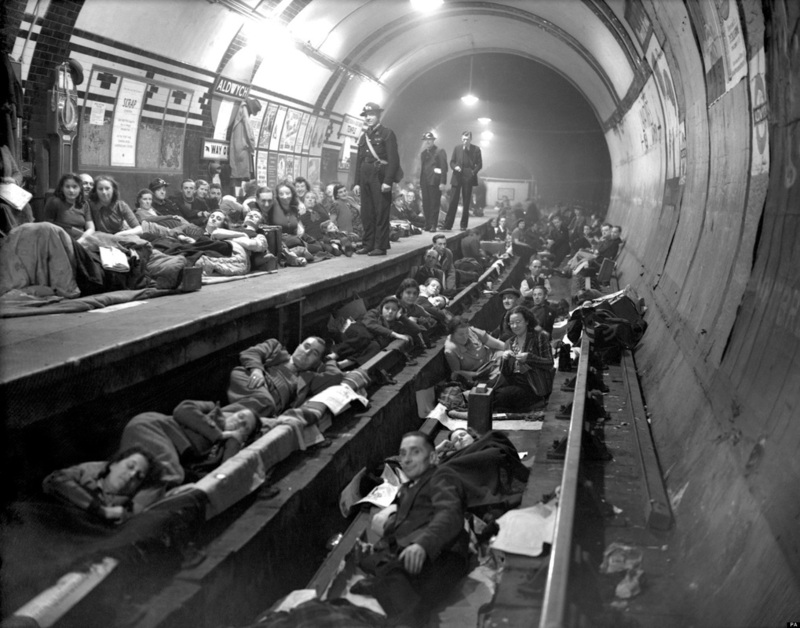 The authorities were initially wary of opening the London Underground for shelter, fearing the effect on morale elsewhere in London and hampering normal operations. On 12 September, having suffered five days of heavy bombing, the people of the East End took the matter into their own hands and invaded tube stations with pillows and blankets. The government relented and opened the partially completed Central line as a shelter. Many deep tube stations remained in use as shelters until the end of the war. Aerial mines were deployed on 19 September 1940. These exploded at roof top height, causing severe damage to buildings over a wider radius than the impact bombs. By now, the Port of London had sustained heavy damage with a third of its warehouses destroyed, and the West India and St Katherine Docks had been badly hit and put out of action. Bizarre events occurred when the River Lea burned with an eerie blue flame, caused by a hit on a gin factory at Three Mills, and the Thames itself burnt fiercely when Tate & Lyle's Silvertown sugar refinery was hit. Initially, the German commanders were reluctant to bomb London, fearing retaliation against Berlin. On 24 August 1940, a single aircraft, tasked to bomb Tilbury, accidentally bombed Stepney, Bethnal Green and the City. The following night the RAF retaliated by mounting a forty aircraft raid on Berlin, with a second attack three days later. The Luftwaffe changed its strategy from attacking shipping and airfields to attacking cities. The City and West End were designated 'Target Area B'; the East End and docks were 'Target Area A'. The first raid occurred at 4:30 p.m. on 7 September and consisted of 50 Dornier and Heinkel bombers and large numbers of fighters. This was followed by a second wave of 170 bombers. Silvertown and Canning Town bore the brunt of this first attack. Children of the East End who have been made homeless. The effect of the intensive bombing worried the authorities and 'Mass-Observation' was deployed to gauge attitudes and provide policy suggestions, as before the war they had investigated local attitudes to anti-Semitism. The organisation noted that close family and friendship links within the East End were providing the population with a surprising resilience under fire. Propaganda was issued, reinforcing the image of the 'brave chirpy Cockney'. On the Sunday after the Blitz began, Winston Churchill himself toured the bombed areas of Stepney and Poplar. Anti-aircraft installations were built in public parks, such as Victoria Park and the Mudchute on the Isle of Dogs, and along the line of the Thames, as this was used by the aircraft to guide them to their target. On 3 March 1943 at 8:27 p.m., the unopened Bethnal Green tube station was the site of a wartime disaster. Families had crowded into the underground station due to an air raid siren at 8:17, one of 10 that day. There was a panic at 8:27 coinciding with the sound of an anti-aircraft battery (possibly the recently installed Z battery) being fired at nearby Victoria Park. In the wet, dark conditions, a woman slipped on the entrance stairs and 173 people died in the resulting crush. The truth was suppressed, and a report appeared that there had been a direct hit by a German bomb. The results of the official investigation were not released until 1946. There is now a plaque at the entrance to the tube station, which commemorates the event as the "worst civilian disaster of World War II". The first V-1 flying bomb struck in Grove Road, Mile End, on 13 June 1944, killing six, injuring 30, and making 200 people homeless. The area remained derelict for many years until it was cleared to extend Mile End Park. Before demolition, local artist Rachel Whiteread made a cast of the inside of 193 Grove Road. Despite attracting controversy, the exhibit won her the Turner Prize for 1993. By the end of the war, it is estimated that 80 tons of bombs fell on the Metropolitan Borough of Bethnal Green alone, affecting 21,700 houses, destroying 2,233 and making a further 893 uninhabitable. In Bethnal Green, 555 people were killed, and 400 were seriously injured. For the whole of Tower Hamlets, a total of 2,221 civilians were killed, and 7,472 were injured, with 46,482 houses destroyed and 47,574 damaged. So badly battered was the East End that when Buckingham Palace was hit during the height of the bombing, Queen Elizabeth observed that "It makes me feel I can look the East End in the face." By the end of the war, the East End was a scene of devastation, with large areas derelict and depopulated. 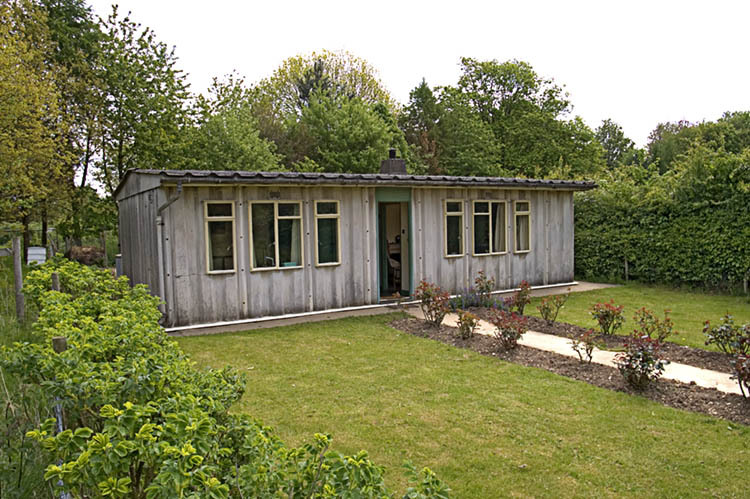 War production was changed quickly to making prefabricated housing, and many were installed in the bombed areas and remained common into the 1970s. Today, 1950s and 1960s architecture dominates the housing estates of the area such as the Lansbury Estate in Poplar, much of which was built as a show-piece of the 1951 Festival of Britain.